Ok, ok I'm betting most of the people who read the title of this post will immediately have "chestnuts roasting on an open fire" running through their heads. Am I right?? 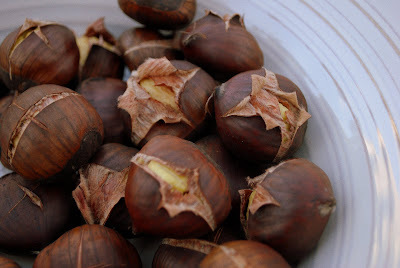 Just like artichokes and baccala and pomegranates, chestnuts will always make me think of my Dad. We get them every year about this time. Stored in big barrels in the grocery store, it's always a sure sign that Thanksgiving is just around the corner. When they are shelled they kind of look like little brains to me. In fact, when I was little, I can remember pretending that they were the brains of evil and hateful, little, tiny monsters and I giggled gleefully as I swallowed them down. I really did do that, silly as it sounds, and I always think of it every time I eat them. 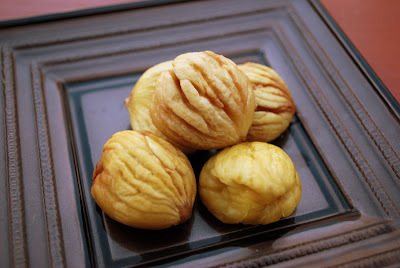 I have been eating "roasted" chestnuts for as long as I can remember. Ok so we bake them but we never call them baked chestnuts, just doesn't sound right. If you haven't eaten them before you really should try them. They have a smooth and buttery taste and are very tender. I usually pick up a couple of handfuls when I buy them. The trickiest part of baking them is cutting the X in the top of the nut. BE CAREFUL! They can be slippery little suckas and you don't want to find yourself headed to the emergency room before you get to munch some of these down. I let John do the dirty work. 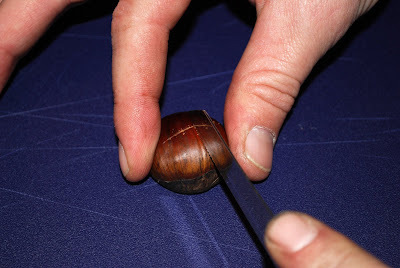 You want to put the nut flat side down on a cutting board or in a very thick pot holder in your hand. John used the cutting board method and a very sharp knife. Being very, very careful he sliced right through those outer shells, making an X in each one. This allows the steam to escape. If you skip this step you will have exploding chestnuts in your oven. In fact one of mine exploded this time. The outer shell mustn't have been scored deep enough and about 20 minutes into the baking I heard a big pop and a ricochet off the oven walls. BAM! Lost one. You will have to excuse Johns grubby hands. Just before he scored these for me he had put new brake pads on my car. Even though his hands are clean, they still are a bit stained with grease. Good thing no one eats the shell. Once you have cut the X into all the nuts, place them on a cookie sheet (X side up) and bake in a preheated 425 degree oven for about a half hour. You will see the shells start to crack open. That means they are finished. Let them cool for a bit before you touch them. They are very hot. It's best to peel them when they are still warm. 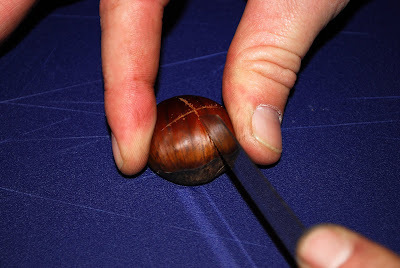 Cold chestnuts are much, much harder to peel. If you haven't tried them I hope you and I hope you imagine that your swallowing little monster brains so I won't feel so alone in my crazy thinking. Thanks! C'mon they do look like little brains! I adore chesnuts too...so did my Dad! Isn't it great to have these little things that can bring us back to a special time. I loved your post. I better go buy some and not wait for Thanksgiving! Ooohhh, chestnuts... before he retired, my dad had privileges at one of the local children's specialty hospitals. There was a big chestnut tree near the parking deck, and every fall he would gather a huge pile of fallen chestnuts (under the bemused glances of passersby and security guards) that he and Mom would roast and then freeze. Ok yeah I was thinking the song! LOL! I've never had these I'll have to look for them in the store. I have such fond memories of buying roasted chestnuts from the street vendor in Munich. We've made them at home, but it's just not the same. I had these for the first time a few years ago at a realtive's home. I thought they were amazing! I couldn't keep my hands out of the bowl. I'm looking forward to "roasting" my own this year! Thanks for the how to.